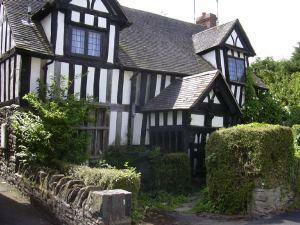 Weobley Heritage Trail.work Walking RouteThe Medieval village of Weobley, the Jewel in the Crown of the Black and White villages, launches its Weobly Heritage Trail that gives visitors a flavour of the life once lived in the interesting buildings in this charming village. Once a busy market hub, Weobley was bypassed by the industrial revolution which brought the train and subsequent prosperity to rural England. But, as a result, many of its medieval buildings survived modernisation by the Victorians, and the Heritage Trail helps to explain the architectural features of some of the early buildings. Not only will you better understand the structures, but you will gain an insight to the stories behind the façades. You can see the house where Charles I stayed on September 5th 1645 the day after his army had relieved Hereford from Cromwell’s troops. See the impressive memorial to Col. John Birch, Cromwellian turned Royalist, who retook Hereford again later that same year for Cromwell with a small party of men dressed as ice breakers as they crossed the frozen River Wye. The trail is in two parts with the first in the village centre which takes about 30 minutes. There are plenty of places to stop and rest or have refreshments and the walk is easy with no hills to climb and perfect for all the family. The second part is the outer village which includes the fine Parish Church where Col. Birch is immortalised. Col Birch settled in the area, became a Member of Parliament and was responsible for rebuilding the church spire. The tall 14th century tower is the only spire in the country to be supported by little flying buttresses connected to pinnacles rising from the tower and it is the second tallest spire in Herefordshire. You can download a map of the trail from Weobley Heritage Trail and a recording by Mary Rhodes, BBC presenter and Weobley girl from www.weobley.org. The spoken word adds even more enjoyment to the trail. Having visited Weobley, you will leave knowing where “hitting the sack” came from and just what is a “cruck” and a “top dog”. For a day out, a weekend or longer, Weobley has a lot to offer the whole family.